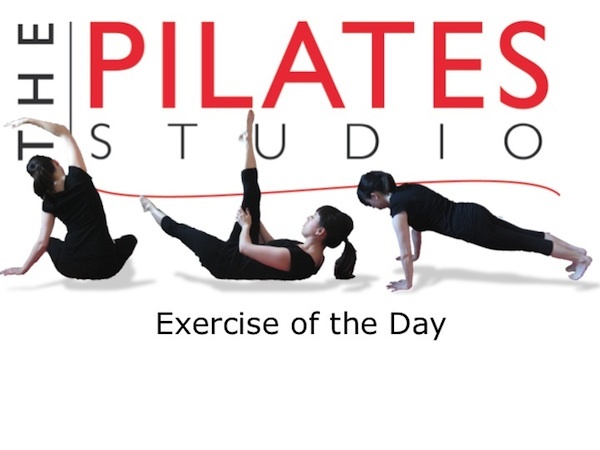 This exercise is the fourth exercise in Joseph Pilates’ stomach series. It engages the core while introducing rotation to the spine. To do this exercise you will need a mat. Start by lying on your back with your knees and feet in a tabletop position. Lace your hands behind your head. Inhale to prepare and then exhale as you reach your right elbow to your left knee and straighten your right leg just above the ground. Exhale again as you switch to the other side. Then inhale for two switches and exhale for two switches, until you have complete 8-10 breath cycles. Then rest your head, neck, and shoulders to the ground. If you have osteoporosis you should not do this exercise. Feel free to check out The Pilates Studio’s weekly blog because we dedicated the month of October 2012 to bone building workouts. In this exercise there is a tendency to do all of the rotation at the neck and shoulders. It is important to remember that the ribcage is rotating too. Imagine reaching your elbow to your knee, your arm toward your thigh, but most importantly reach your rib to your hip.